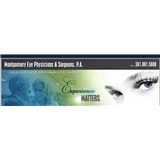 Montgomery Eye Physicians & Surgeons (Rockville) - Book Appointment Online! Montgomery Eye Physicians & Surgeons are committed to providing you with the highest quality and most comprehensive medical and surgical eye care available in a warm and caring atmosphere. Our physicians are board certified ophthalmologists whose offices have been established in Montgomery County for over 40 years. With offices in Rockville and Gaithersburg.